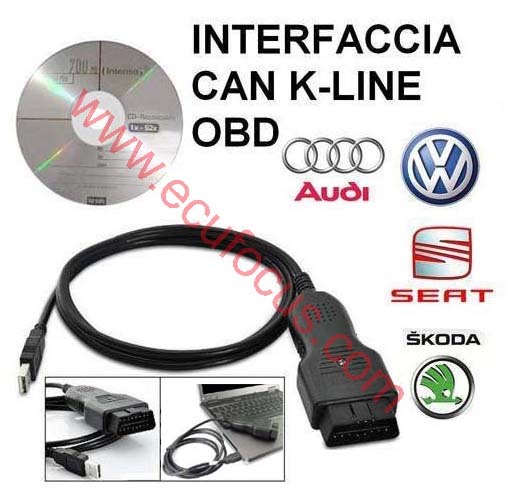 VAG COM VCDS is a software package for Windows that emulates the functions of the dealers' very expensive proprietaryscan tools. 2000:The first truly affordable, full-function diagnostic system for VW/Audi. Constantly updated software has ensured compatibility with all VW, Audi, Seat and Skoda passenger cars through the current model year ever since. 2001: The first tool to allow users to view and log of 3 groups of Measuring Blocks (live data) simultaneously. 2002: The first aftermarket tool which supports 7-Digit SKC codes and is able to access modules requiring proprietary VAG modes on the KWP-2000 protocol (2001+ Teves Mk.60 ABS, numerous 2002+ modules). 2003: The first tool of any sort which displays critical timing information on TDI engines in graphical format and allows graphing of Measuring Blocks (live data) in oscilloscope format via an open-source plug-in. 2004: The first aftermarket tool with full support for new VW/Audi models requiring a direct CAN connection for diagnostics. 2005: The first aftermarket "VAG" tool to include generic OBD-II capabilities at no extra charge and to decypher the new 'Long Codings' used in the latest models. 2006: First to make it easy to find the live data the user is looking for with the Advanced Measuring Values feature, show vital freeze-frame data for fault codes in-line with the DTCs themselves, and incorporate the ability to do Acceleration Measurements. 2007: First aftermarket tool to support Optical Bus Diagnostics and built-in scripts for forcing Readiness Monitors to run. 2008: First aftermarket tool to support reading and clearing of DTCs from modules using the new UDS/ODX/ASAM protocols introduced in the Audi B8 platform and first to include a Gateway Coding Assistant. 2009: First aftermarket tool to support Measuring Values, Output Tests, and Adaptations on control modules using the new UDS/ODX/ASAM protocols, and to properly support resetting of all 3 independent counters used for Service Reminders in 2008+ model Audis. 2010: First aftermarket tool to support Basic Settings on control modules using the new UDS/ODX/ASAM protocols, and first to be available as a full 64-bit version for PCs running 64-bit Windows. 2011: First affordable tool with any support at all for VW Crafter vans, and of course compatibility with all the latest 2012 model VW/Audi Group passenger cars. 1. Re-factored DTC routines which interpret DTC data. Separated routines by protocol; Enhanced interpretation of status byte for DTCs in UDS modules. Added check-box to disable the "Aggressive" fault reading mode we have always used under UDS because it was frustrating to some dealer techs that VCDS showed more DTCs than the factory tool. 2. Added an area to display additional info for Basic Settings. The data to be displayed in this area comes from the Label files and it may take some time before tips are included for most Basic Settings groups. 3. Added data types 0B, 0D, 0F to Generic OBD-II Mode 9. Fixed some bugs in the display of certain high-numbered, rarely used PIDs. Enhanced ROD (ODX) Data. Includes coverage for additional new control modules. You must install VCDS on your PC's hard disk! It may not work properly if you try running it directly from other media. However, you can use other media such as a CD or USB memory key to move the distribution file from a PC with internet access to another PC that does not have internet access. Connect an appropriate interface between the computer and the car. Click [Options] and select the correct communications port. Use [Test] to confirm that the program can use the port and find the interface. Now Play. Make sure the software can reliably access all the control modules that it should in your car. See ourApplication Charts. Query Fault Codes from some modules. Please check back frequently for updates! If you want to be notified of updates via e-mail, please subscribe to theVAG-COM-Announce mailing list. Windows 95, 98, ME, and NT4 are no longer supported. Release 11.13 must be used with a HEX-, KEY-, KII-, or Micro-CAN "high-tech" Interface. It is essential NOT to install in the Program Files tree in on systems running Windows Vista or 7. The "Standard" USB drivers in Release 11.13.1 are older than the ones that came with Release 11.13.0 (which were less than 100% reliable on some PCs). When you install the drivers that come with this version, Windows may complain that they are older than the ones which are already installed. If that happens, you must answer "Yes" when asked if you want to replace the files anyway.